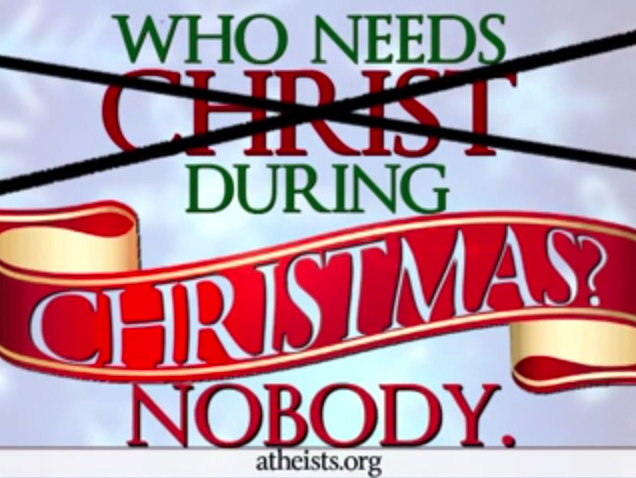 “Who needs Christ during Christmas?” is this year’s annual anti-Christmas initiative by the secular atheist group known as American Atheists. The campaign comes as no surprise. Every year, atheist and humanist organizations launch their predictable attacks on Christmas. This year’s campaign comes complete with personal testimonies by atheists who declare that they need neither Christ nor religion to enjoy the season. Ironically, the added testimonial element makes this year’s campaign feel somewhat religious. I have stated in previous years that I am neither offended nor threatened by these irreverent attacks on Christmas. Instead, I have come to regard them as opportunities for non-believers and believers alike to think deeply and to dialogue openly about the meaning of Christmas and the Person of Christ. And that’s not a bad thing. As Christ-followers we must never allow the business and stress of the season to distract us from Christ, the central figure of Christmas. We should think and talk about Christ at Christmas. As believers we are called to love God with all of our mind, to own our beliefs, and to be “prepared to make a defense to anyone who asks you for a reason for the hope that is in you; yet do it with gentleness and respect” (1 Peter 3:15). While we can’t stop atheists from exercising their First Amendment rights, we can use what they say as a springboard to share an opposing view. When you think about it, anti-Christmas campaigns are nothing new. They are as old as Christmas itself. Herod launched the very first one. He didn’t need or want Christ either. I have visited Bethlehem, the place where Jesus was born. At the time of Jesus’ birth, Herod lived in the Herodium, a large and luxurious palace built on top of the highest real estate in the area. Herod’s palace was so imposing that the first rays of the sun painted its shadow across Bethlehem each morning. Jesus was born in the shadow of Herod’s greatness. Today, Herod’s palace lies in ruins and he is remembered as the paranoid megalomaniac who killed babies (Matt. 2:16-18) in an effort to maintain his power. And yet, one baby born beneath the shadow of his palace became a greater king than him and changed the world forever. So, it’s really not surprising that the attacks on Christ and Christmas continue today. Like Herod, every person must decide for themselves what they will do with Christ. As for me, I am not ashamed to confess that I need Christ during Christmas and every day of the year. For me, Christianity is not a religion and Christmas is not about religion. It’s about a personal relationship with the One who came to us in the most vulnerable and humble way in order to show us what love looks like. I will always keep Christ in Christmas. Without Christ, there is no Christmas. He is the reason for the season! Amen, Beth. Best wishes for a Merry Christmas. Well said! We all need Christ, that is why we even have Christmas! Love it–great blog. Merry Christmas, friend. Give our love to Cheryl & your family! Hugs! Thanks so much, Kristin. Merry Christmas to you and your sweet family. Love you all.